I was expecting a somewhat intense read from this one, a bit of a heart-wrencher, even. I wasn't quite expecting the punch in the gut I got when I realized what had happened to Caitlin's brother. 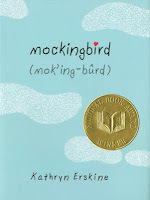 And then I read the Author's Note (quite appropriately, thankfully, placed at the end of the book) and realized that what I hadn't expected was in fact central to the conceptualization of the novel; not an aside, as I had thought prior to reading the book, but the reason Erskine wrote Mockingbird in the first place. Makes me realize that my After School Club and I are going to have a hell of a discussion when they're done reading this one. I'm really curious to see what they thought. Consensus from the few who have finished it is LOVE. That includes one of the parents, who said she bawled through her breaks at work because she couldn't put it down once she'd picked it up out of curiosity. Hard to talk about this without spoilers, and I'm glad it wasn't spoiled for me, so I'll try not to spoil it for you. Instead, I can talk about what everyone knows from the summary of the novel: Caitlin is a ten-year-old girl with Asperger's syndrome. She's bright, loves to read, and is an amazing artist, but she's socially inept. She can't figure out people, and she's not sure she wants to bother. Especially now that Devon, her older brother who always explained things to her, like why she can't do certain things and why she has to do others, is dead. Devon's gone and Caitlin's father is sad, and Caitlin is adrift in a world that doesn't make sense to her without anyone to help her navigate it; all she has is her trusty Dictionary, a list of things she's really good at, a school counsellor, and Devon's memory to help her along. Mockingbird is told from a perspective that feels at times pretty alien, but Erskine does an excellent job of making Caitlin relatable. I'll be curious to see what the kids think about the perspective, and how they feel about the idea of a writer trying to put herself in the shoes of someone with such a different way of seeing the world; it's a question I always struggle with, myself. Caitlin's voice does feel real, and the portrayal of her mental processes is nuanced and careful without feeling over-cautious. But... is it... authentic? Is that really the way people with Asperger's view the world? And if it's not... where does that leave us? Does it matter? I struggle with this. I would struggle with this further here, but the fact that I've written the next two paragraphs of this review four times and never once been articulate myself well enough to publish it suggests perhaps this isn't the time. Suffice to say, I am curious about the perspective, and I am cautious for a whole multitude of reasons, but I think that it did work for what Erskine set out to do. Because it is in our nature as readers to try and understand and connect with the narrator of the books we read, especially first person narrators, we want to understand and connect with Caitlin, even though she has a very different way of viewing the world. Putting the reader in someone else's shoes is exactly what Erskine wanted to do. And though it is clear that Erskine works hard to make that connection possible, it's also true that she, as the author, disappears; I never felt her hand guiding me, I only heard Caitlin's voice. And this is where I come to the part where I didn't unreservedly love the book. I did think it was largely excellent, and I did think it was ambitious, and the kids reading it in my group are really, really connecting with it. It's way out of my own comfort zone, because I don't like reading sad books and I'm not wild about contemporary, realistic drama. I've never liked stories about bad things happening to children, and having one of my own has made it doubly hard. That's all in the realm of "I know it happens, I don't particularly need fiction to bring it home to me. I'm anxious enough as it is." But I'm not sorry I read Mockingbird, because it was powerful and it was meaningful and, as I've said, I think the discussions already starting to come out of it with the kids in my After School Club are going to be worth the psychological discomfort. BUT. There were a couple of times where I was painfully aware I was reading fiction, and fiction dealing with Issues. Particularly in regards to one of the characters, Josh, cast as one of the villains of the piece; I'm not sure the piece needed villains. And of course Josh isn't really a villain, just another kid dealing with a difficult situation. It's that of course that's the problem -- he felt like he was in there to provide discussion fodder, not as a character himself. Even worse, though, was Caitlin's arc towards the end of the book. It felt too easy, too pat, too solved. Too much like there was going to be a happily ever after, and while of course I love happily ever afters, this one felt too easy and too fast and therefore rang false. And not just in relation to the closure she was seeking, but more in relation to her Asperger's, and that was where I had a lot of trouble, and what brought my roaring discomfort with Asperger's-as-storytelling-convention to the fore. Despite all this, I didn't finish the book with a bad taste in my mouth. However, I also didn't bawl my eyes out, or even shed a tear. The overall impact of the book did suffer for me. The flaws will be worth discussing too. I want to know if the kids felt the same way, saw the same things, or if they are so deeply in love with the book that they just swallowed it whole (I know this is my tendency with books I've loved.) I'll have to be careful not to be the grinch who picks apart a beloved book, but I think I can discuss it from a place of respect and interest. So, recommended, but especially recommended if you've got someone to discuss it with. Not the most brilliant book I've ever read, but well-written, ambitious, and worth reading even with its flaws.